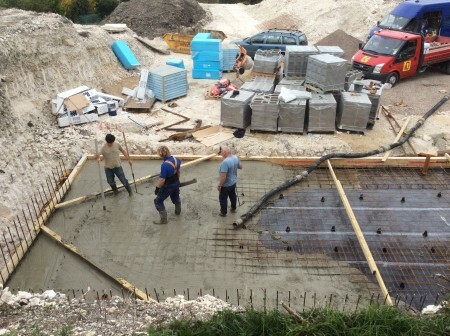 On Friday we poured the main part of the slab using three concrete lorries operating a relay system between Lewes and Hailsham where Peter Woods and his team from Woods Concrete Pumps have their plant. From first thing in the morning, the site was buzzing with activity and the heavy clunk-clunk-whirr of machinery. Each lorry waited its turn at the bottom of the steep road whilst the one ahead mixed up the concrete and off-loaded it on site. By using this relay system, we were able to accurately judge the right quantity needed for the slab which meant no wasted surplus of pre-mixed materials. 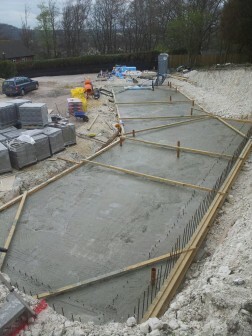 The anticipated total pour was 36 cubic metres, 6 pours of 6m cubed each. In the event, we only needed 27 cubic metres. 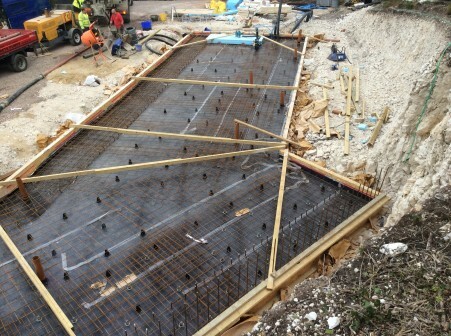 Joe and team reinforced the shuttering with timber planks of 6 metres span (the width of the house from front to back) and with 3-4-5 constructions at the corners to ensure perfect right angles. These supports are needed to prevent any bulging or distortion now the slab is down.